What do you do if you don’t understand something? Keep reading the same sentence over and over again? Maybe that will work. Maybe it won’t. Or you could grab some coloured pens and mind map out the content. This is what I do when I’m struggling to understand something. And this has worked for me without fail for the past 10 years. Whilst I’m sold on mind mapping, I realise you may not be. Common barriers to mind mapping are time (“It takes too long”) and the perception of a lack of artistic ability (“I can’t draw”). But here’s the thing: I’m time poor and I can’t draw particularly well but I haven’t let that stop me. You see, mind mapping is actually insanely easy to do and if you practice and silence your inner critic you can save a whole heap of time studying. 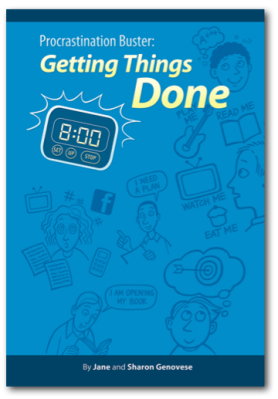 So if you’re serious about reclaiming your time and being able to study less and do more of the things you really want to do, then it’s worth giving mind mapping a shot. Below are 5 important things you should keep in mind when you first start mind mapping. Draw lots of pictures. When you get sick of drawing, take a deep breathe and continue to draw some more pictures. The Picture Superiority Effect shows that humans retain more information about an idea when it’s conveyed as a picture than just using words on their own (check out this 30 second explanation). You don’t actually have to draw pretty pictures on your mind maps. Pretty, intricate pictures are actually a distraction from doing what you have to do when you mind map: learn information at a deep level. And if the picture is absurd and exaggerated, that’s even better for aiding memory retention and recall. A year 11 student got really annoyed with me a few years ago because I didn’t give her a copy of a mind map I’d created before her human biology test. Here’s the thing: it wouldn’t have made much difference if I had given it to her. Why? Because she didn’t create it. You don’t learn complex information very well (if at all) by looking at someone elses mind map and absurd images. You get the edge by taking the time to think through the different ideas and map them out. Sorry, there are no short cuts. You have to put pen to paper. People can be patronizing and even down right rude when they see you mind mapping. I experienced this several times in law school. “Isn’t that cute!” students would say as they saw me mind map out legal ideas. But looking back, I can’t help but think that maybe these people were slightly insecure. If someone makes a comment like “Cute pictures!” or “That technique doesn’t work for me. I need to take notes on my laptop” just smile politely, say something like “You have to do what works best for you” and carry on mind mapping. Don’t get me wrong, I think technology is great but just not for mind mapping. When you mind map you want a sense of freedom to explore ideas. You don’t want to be limited in any way and you certainly want all your senses to be engaged. “It [mind mapping by hand] provides more cognitive stimulation than, say, a smart phone which reduces our world to a sterile and odorless screen barely the size of a coaster. This is limiting, whereas creation should be about expansion and freedom and discovery and roaming. That’s right, paper doesn’t crash. Paper also doesn’t beep to notify you that you have a new message or email. 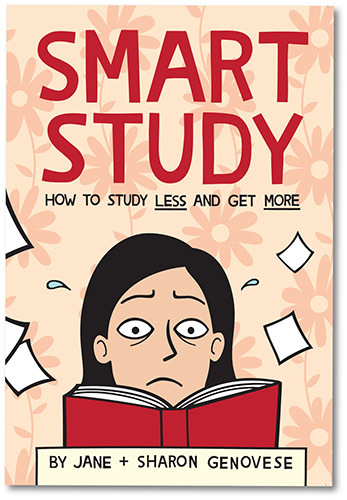 Despite all the amazing technological advancements, when it comes to efficient learning I believe simple methods (e.g. working with pen and paper) are often the best. Let’s face it, everyone loves a rainbow, especially a double rainbow. All those colours are nice to look at. Just like your brain appreciates a rainbow, your brain prefers to look at lots of different colours on a page than just one colour (e.g. black or blue). Using different colours for the branches on your mind map helps to separate out each of the ideas as well as highlight and group together similar ideas. Above is a mind map on how to mind map. 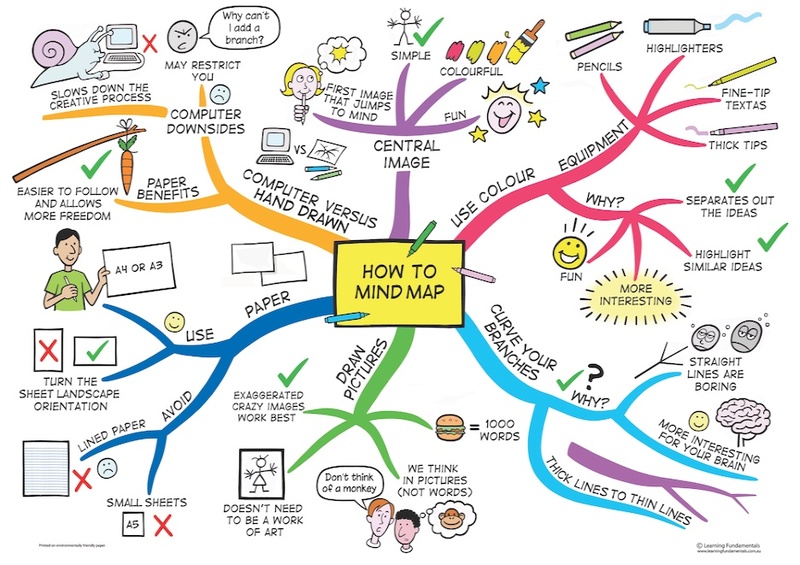 Whilst this mind map looks nicely illustrated and has been touched up on a computer, just remember your mind maps don’t have to be. Your mind maps can be as messy as you like. In fact, I recommend that you give yourself permission to create messy mind maps, especially if you’re a perfectionist. So here’s a challenge for this week: set aside 20 – 30 minutes to understand some information you’ve been grappling with by creating a mind map. Grab some coloured pens, a sheet of A3 or A4 paper, a timer and work through the information (follow the tips on the mind map above). When a little negative voice says “That looks like rubbish”, keep going. When you get bogged down, create another branch. The key is to keep moving. Treat it as a fun experiment. Maybe it will work. Maybe it won’t. But like anything in life, you won’t know unless you try. 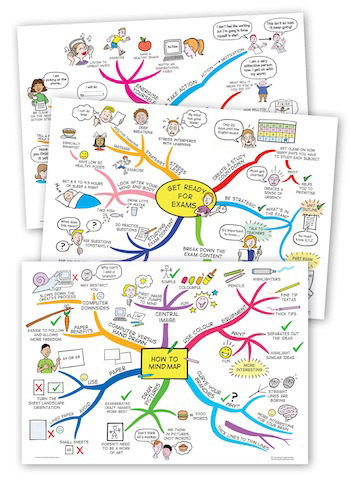 Want to learn more about mind mapping? 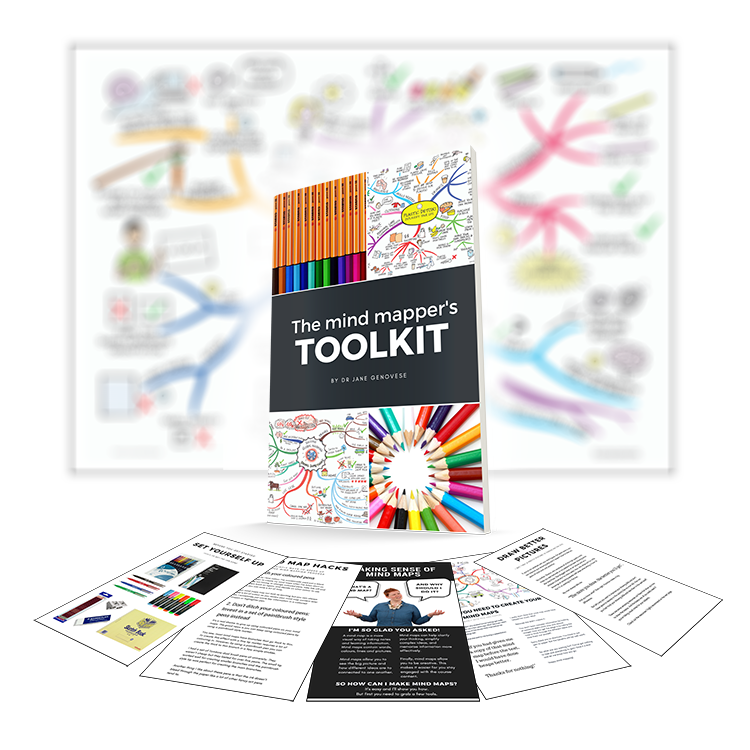 Pick up your free copy of The Mind Mapper’s Toolkit by clicking here. This is a fantastic mind map, something I’ve been using myself a lot lately as I find them invaluable but it is really effective in this case. I’ve never used colours on my MPs, they’re more barely legible scribbles just for my own use but I will do so now having seen this. I noticed the plastics image/mind map on Facebook and that it’s subject to copyright so wanted to check with you if it’s ok to use it in a blog post I plan to write about making small changes with a link to your site? Thanks for your kind words about the mind map. Feel free to use the plastics mind map in your blog post. Thanks a lot, I always have a lot of ideas going on in my head often struggle with mind-overload but when it comes putting my thoughts and ideas into words I find it really, really difficult. I think using the mind map in the way that you said, even though I cant draw for love nor money, will help me out a lot. … but surely the image at the top of this post was computer produced? I think there are two sides to this, and it depends on how and why you’re using mind maps, and who the audience is. I most often use a computer for the first rough-out of a mind map, because it allows for continuing change, growth and maximum flexibility. But this is probably because most of my mind maps are for my consulting business or clients. Often I mind map to organize a lot of information. Or to track information as I research a topic on the web. Here too, a computer-based map is best because links can be embedded in the map. And if you’re working on collaborative mapping with someone geographically distant, a browser-based online mapping tool beats hand-drawn maps any day. But hand-drawn, paper maps really do have strengths in some areas and for some people. The physical pleasure of working with bright colors and drawing your own images (however rough – like mine) can encourage creativity and be motivational. Choosing a hand-drawn map, which means you won’t have to worry about computer navigation or shortcut keys, can help with total focus when trying to carry out a detailed analysis of a subject. The use of color, having items appear in the same place on the map (computer software often moves nodes to make space) and your own thinking about how to illustrate nodes (instead of ’pick a clipart image’) are said to help with learning. The mind map at the top of the post was actually drawn by hand and then touched up on the computer to make it more appealing for readers to look at. No mind mapping software was used. But you’re exactly right – it really does depend on what you’re using mind maps for. I wrote this blog post with students in mind – students who are trying to understand new information. I didn’t mention it in my post (so I will mention it now), I think working at a computer can be too distracting for many high school and university students. It’s way too easy when things get a bit complicated and tough to log onto Facebook or check your email. This is a major reason why I mind map out new ideas with pen and paper far away from my computer! Whilst I am working at developing better self control, sometimes at the end of the day when I’m feeling tired, I find myself getting easily distracted. And sometimes, I just want to get away from the screen and rest my eyes. At the end of the day, everyone needs to explore what is going to work best for them. jane there are few question that i had, since i realized mind mapping ,here’s the first one: if you want to study a lesson or a subject ,you should mind map while you’r studying or after that you’ve read the subject and understand it? another question is : how should i choose keywords and what keywords do in mind maping ? and the last one is:if the text i want to study contains a lot of important details ,should i write them all in mind map,if not how am i suppsed to remember them? the reason i asked you these questions was that you have a compelete knowledge about mind maping and the only person that explain things better than everyone. You ask some good questions! I often mind map as I study as I find drawing out the information helps me to understand it better. I’ll read a sentence or two and then mind map out the information. I find this works best for me. There are no hard and fast rules. It is whatever is going to resonate with you and stick in your mind. Don’t copy out things from your books word for word though. Try your best to explain the ideas in your own words. Again, it depends. Sometimes I will mind map out all the important nitty gritty details but other times if it is too much, I will leave that information for flash cards. Mind maps are a great way to get an overview of a subject area but my advice is for best results, use them combined with other strategies.